have you measured how many lbs of feed per lbs of pig have you spent per month? I’d like to grow some pigs with the exact same method, but I have no idea how much less feed they’ll need. I didn’t end up having time/being organized enough to do much detailed record keeping as far as our feed use went. 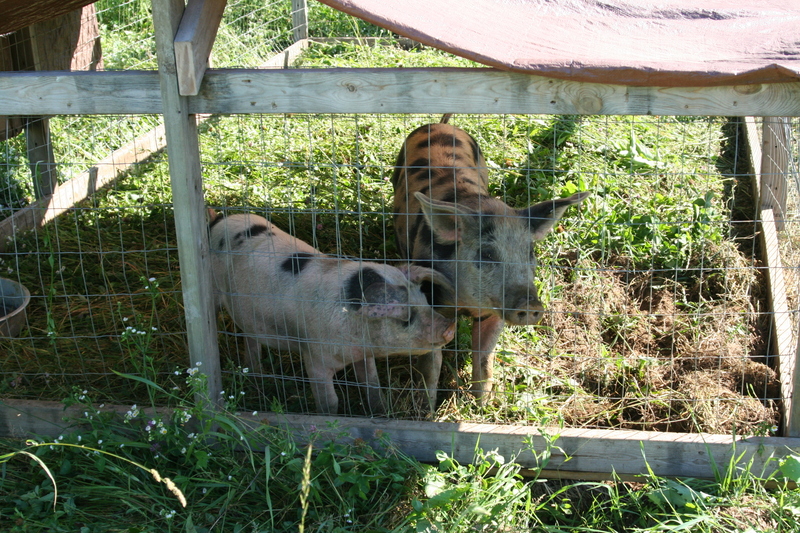 I think over the course of keeping them, we ended up purchasing roughly 6-700 lbs of feed per pig. That’s a rough guess- we weren’t completely consistent on how big we let them get, they were 3 different breeds, etc. And of course the amount per day varies based on where they are in their growth/development. It’s something we’re hoping to improve upon somehow this year. If we could come up with one feeding a day from another source, it would knock down the cost quite a bit, even if it took a bit longer to reach finishing weight. My biggest thought right now is to find and harvest some more mature weeds/grasses to feed at one meal a day. Mine dug around some and ate mostly worms, I think, from rooting. They would graze a bit as well, but I don’t think they ate that much of their meal from the pasture. But they would strip off the tops of the mature weeds to eat with enthusiasm. I also never really MADE them eat the weeds or go hungry for a meal. I may try that for the one meal this year. I think it’s still the way to go, though. Healthier, happier pigs, some food benefit for the pigs and in the nutritional value of the meat produced, and much less work/smell to keep them. If you haven’t gone to the Sugar Mountain site I linked above, check it out. He’s got lots of experience and info about pasture raising pigs, and has an outline for what he feeds his there- NO purchased grain (but has resources available that others may not have). Did you feed them twice daily? Yes- twice a day. I used the scratch grains for one meal a day until shortly after this post. They were only minimally cheaper, so I didn’t feel it was worth the hassle/electricity to run the crockpot, and they were growing too big to only use one crockpot full. I have heard of keeping a covered barrel of soaked corn- soaking for a week or more, and dipping it out to use as needed. I think they call it “soured corn” in the past. If you’ve got a strong stomach, some would open the top of the barrel for a day to let flies in and leave it several days longer to let maggots hatch and grow- increasing the yield and protein/nutrition content. I can deal with a lot of gross things, but maggots are on my short list of things I don’t deal well with! I liked the variety of scratch grains over plain corn- maybe I should try soaking them for a bit longer this year and give it another shot. Our scratch grain is oats, wheat, and cracked corn- but I can get them separately as well, and it might be cheaper feed with less corn.